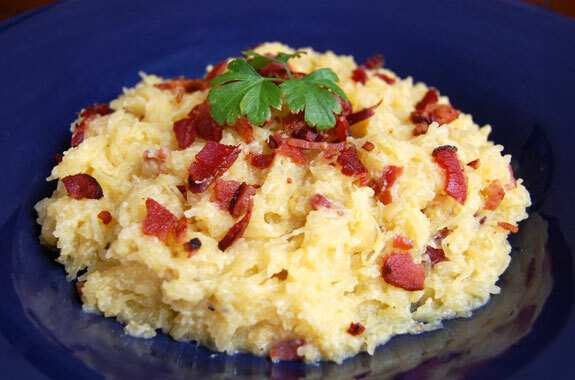 Traditionally, carbonara incorporates heavy cream with bacon and egg¬¬s to coat pasta. 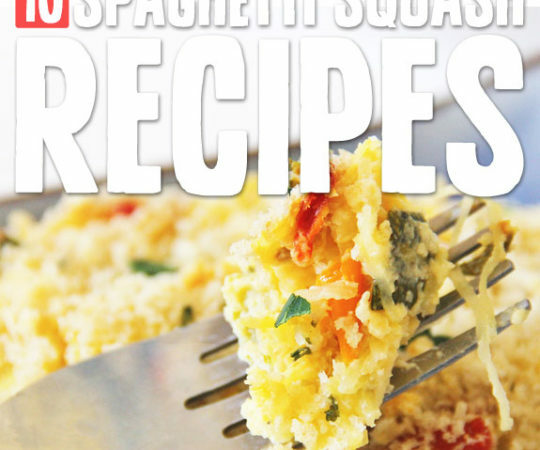 In the new and improved version, spaghetti squash makes this dish gluten-free and coconut milk makes it dairy-free. The eggs are cooked just enough to make a creamy, luxurious coating over the squash noodles, speckled with salty bacon. The first step is of course roasting the squash in the oven. I have seen some other ways of cooking the squash online, including just microwaving it for a long period of time. I personally like the squash drizzled with olive oil and roasted. After the squash has been roasting for about half an hour, you can start preparing your other ingredients. Whisk together the creamy egg mixture in a small bowl. And although coconut milk is used (the full-fat kind) the dish does not taste like coconut. Cook the bacon in a skillet and then go ahead and sauté some onions and garlic right in the bacon grease. Pancetta can also be used in place of bacon. If you prefer a spicier version of the dish, add a dash of red pepper flakes to the onions and garlic. 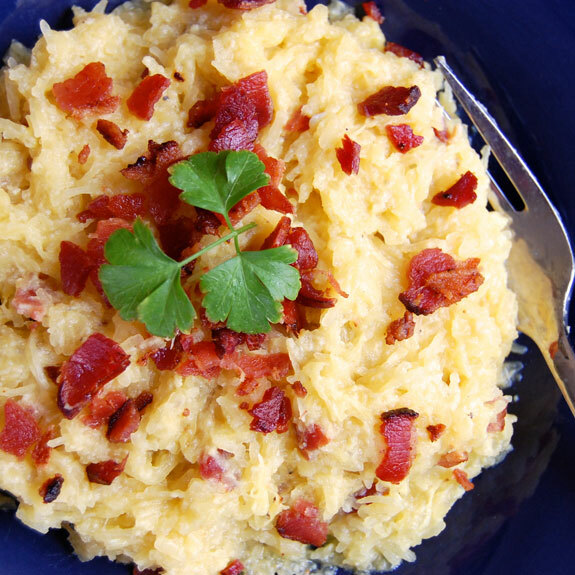 Once the spaghetti squash is shredded, you add that into the pan, along with half of the crumbled bacon – the rest of the bacon is saved for garnish. Peas were also a popular add-in to traditional carbonara. But since they are not Paleo I would recommend stirring in some roasted broccoli instead if you are looking for a green component. We have an amazing recipe for garlic roasted broccoli here. 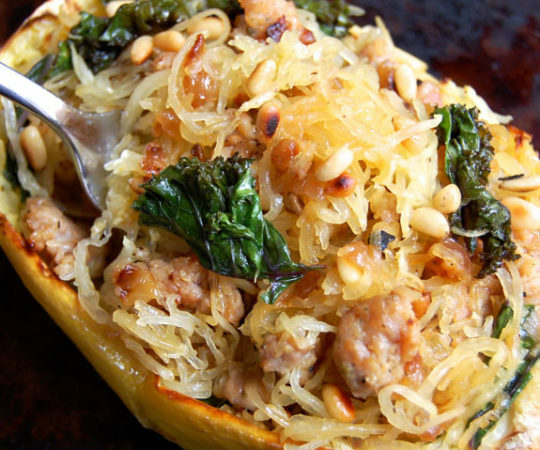 It can roast in the oven at the same time as your spaghetti squash to make a more efficient meal. Next comes the part that requires your full attention. Turn the heat down to the lowest setting and slowly drizzle in the egg mixture with one hand, while whisking vigorously with the other. The goal is to have the eggs cooked just enough to coat the squash noodles without becoming scrambled. To prevent them from scrambling, you have to stir vigorously for 1-2 minutes. You’ll be able to tell once the sauce starts to thicken into a creamy coating. 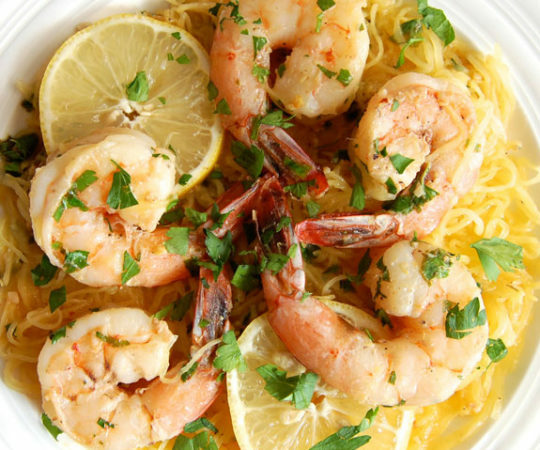 Add this recipe to your collection of gluten-free pasta options for weeknight dinners. 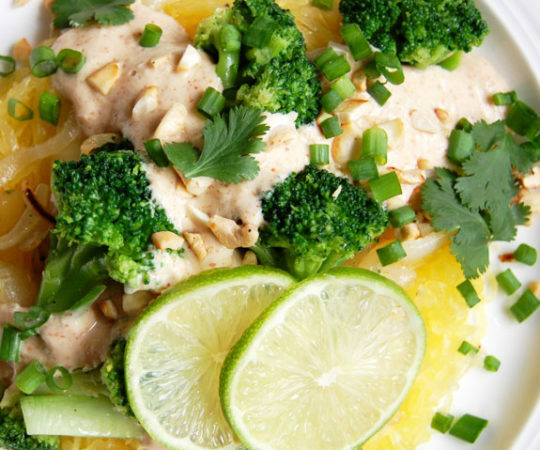 Enjoy a rich, creamy sauce over your squash noodles, without actually adding any cream. And of course, don’t forget the bacon. Preheat the oven to 400 degrees F. Place the squash in the microwave for 3-4 minutes to soften. Use a sharp knife to cut the squash in half lengthwise. Scoop out the seeds and discard. Place the halves, with the cut side up, on a rimmed baking sheet. Drizzle with olive oil and sprinkle with salt and pepper. Roast in the oven for 45-50 minutes, until you can poke the squash easily with a fork. Let cool until you can handle it safely. 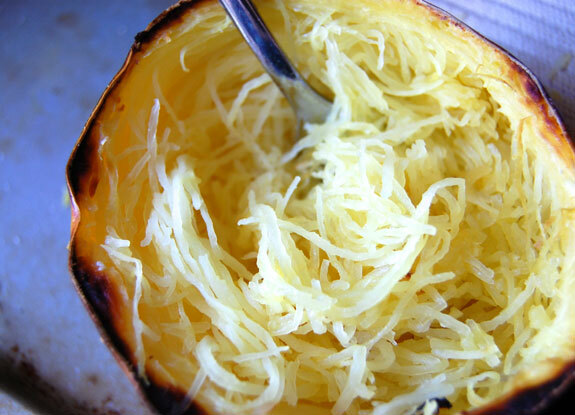 Then scrape the insides with a fork to shred the squash into strands. In a small bowl, whisk together the eggs, coconut milk, oregano, 1/4 teaspoon of salt, and a generous dash of pepper until completely combined. When the squash is almost done baking, cook the bacon in a skillet over medium heat. Remove to a paper towel-lined plate, crumble, and set aside. Discard of the bacon grease, reserving about one tablespoon. Add the onion and garlic to the pan and sauté for 4-5 minutes until soft. 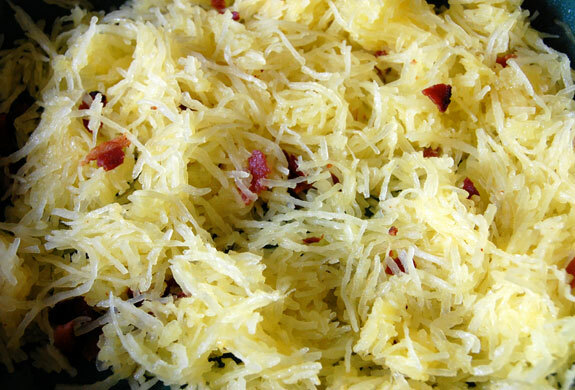 Stir in the shredded spaghetti squash. Add half of the crumbled bacon to the pan and stir to incorporate. Turn the heat down to the lowest setting. Slowly pour the egg mixture into the squash, stirring vigorously. Continue stirring constantly for 1-2 minutes so that the eggs do not scramble, until the egg mixture forms a creamy sauce over the squash noodles. Season to taste with salt and pepper. Top with remaining crumbled bacon and fresh parsley. Serve immediately. Great to hear, thanks Mischa! I tried this recipe tonight and it was delicious. I had never had spaghetti squash before and this is going to be a frequent meal in our house from now on. It was so creamy and delicious. Thank you for this wonderful recipe. You are very welcome Michelle! I’m happy to hear that it’s going to become a regular recipe at your house! Can you use almond or rice milk in place of coconut? Or is this coconut milk in a can, the thicker stuff? I used the thicker coconut milk from a can. You could try almond milk, I am just not sure how it will react with the eggs. Maybe start with a small portion to see how it turns out. Worth a shot! Hi Liz, for this recipe I recommend cooking the bacon so that you can also use the bacon fat from the pan. But for recipes that just use bacon for garnish the bacon bits would be fine. I just made this for dinner tonight and topped with sliced grilled chciken. The hubs says one of the best things I’ve ever made. I concur. Note: if you cut the squash in rings and roast them on parchment or non stick foil, the cook time reduces to about 30 min at 400 rather than an hour. The “noodles” are longer and have a more al dente texture. Made this tonight. Roasted squash in the microwave for about12 min. Used coconut cream instead of milk because that is what I had. Was really nervous about the egg part, but it turned out fabulous!!! Hubs gobbled it down! Will definitely be a go-to recipe from now on!